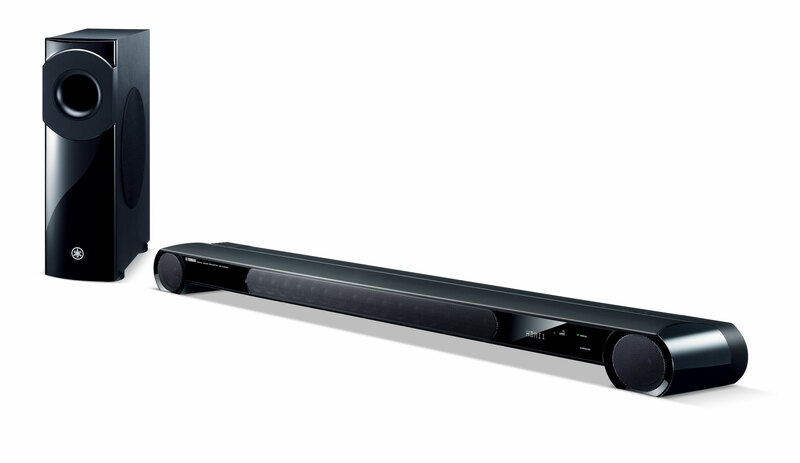 The soundbar uses 16 array speakers controlled by Yamaha's YSP technology plus two powerful 6.5cm woofer units in the large cabinet to deliver excellent sound quality with clearly positioned dialogue and superb surround effect. The aluminium body dampens unwanted vibrations. The result is an expansive sound field that will thrill you with its three-dimensional properties and outstanding imaging. The optional YIT-W12 Wireless Transmitter, used with the YSP-3300, lets you enjoy music wirelessly from your iPod/iPhone/iPad or Mac/PC. Yamaha-developed AirWired technology provides uncompressed linear PCM transmission for consistently clear, accurate sound output. The YSP-3300 achieves actual (not virtual) surround sound by producing beams of sound and using advanced processing to control their directions. 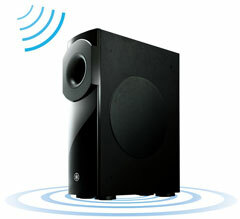 You hear real 7.1-channel surround sound with natural ambience and excellent imaging. 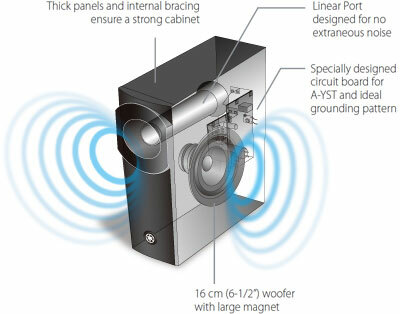 Yamaha technology also provides the additional benefits of a wide "sweet-spot" listening area and the elimination of listening fatigue. The YSP-3300 achieves true surround sound by directing sound beams off the walls to reach the listener from various angles. The main mode is 5 BeamPlus2 for 7-channel sources. In addition, there is a wide variety of other listening modes. You can select 3 BeamPlus2 + Stereo, 5 Beam,Stereo + 3 Beam, 3 Beam, Stereo, Target mode and My Surround. The YSP-3300 decodes HD Audio signals to ensure that you hear the best possible sound from Blu-ray Disc players, as well as from all other digital sources. 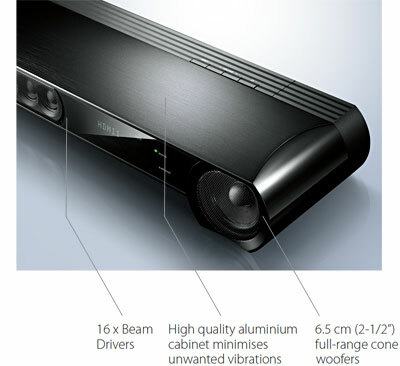 This Yamaha exclusive feature ensures optimum multichannel sound reproduction with accurate image location. By monitoring and analysing the sound with the microphone included with the YSP-3300, IntelliBeam automatically sets the best beam angles, while optimising the level and frequency response of each beam. This makes initial setup both extremely simple and acoustically perfect. 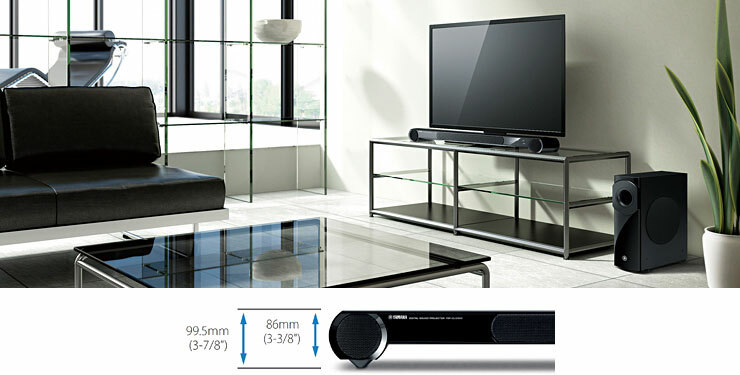 Only 86mm high, the YSP-3300 can easily be placed in front of your TV without blocking the screen. The height can be adjusted in two levels by adding the spacers. It is also wall mountable (brackets optionally available). When connected to a CEC-compatible TV, such as a Panasonic VIERA Link TV, the YSP-3300 will turn on and off together with the TV, and you can use the TV remote unit to control the volume. CEC also provides advanced functionality with other components. 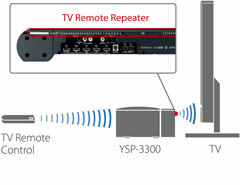 Even if the YSP-3300 blocks the TV’s remote control signal, the TV Remote Repeater on the back transmits the signal to the TV so operation is not affected. You can store three groups of settings for quick recall. 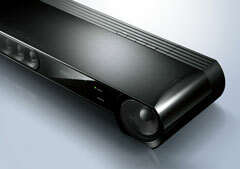 Settings include playback mode, CINEMA DSP mode and IntelliBeam measurement results. When enabled, the display turns off and the unit enters the standby mode under various conditions, such as no input signal for 30 minutes.